Union Public Service Commission (UPSC) is an organization that works under the Central Government to assign employees in various positions in various ministries and departments and subordinate offices. The Commission also conducts the examination for recruitment in different departments of the state. 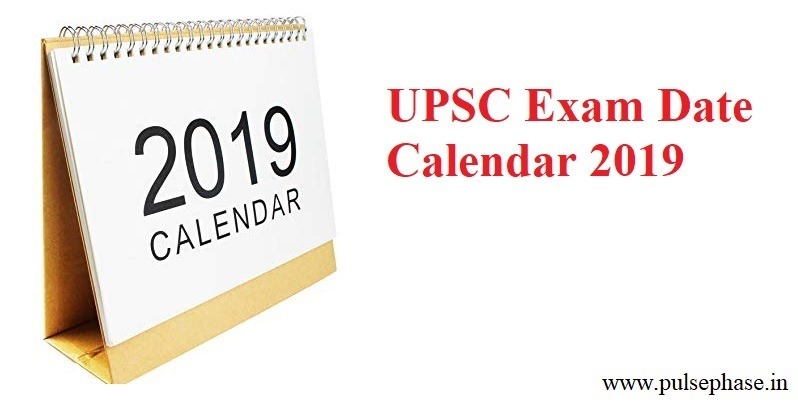 UPSC (Union Public Service Commission) has been announced the Examination Calendar for the year 2019, whereby, candidates can get an idea for UPSC Exam Schedule for all the exams which are conducted by UPSC (Union Public Service Commission). According to the date sheet of the calendar, the CS main exam will be held on the 20th of September 2019. Candidates can see the schedule of the exam released by UPSC like Combined Medical Services Examination, 2019, Geologist Examination, Civil Services (Main) Examination, 2019, N.D.A. & N.A. Examination (II), 2019, CISF AC (EXE) LDCE-2019, N.D.A. & N.A. Examination (I, Civil Services (Preliminary) Examination, 2019 and Engineering Services (Preliminary) Examination, 2019. The IAS 2019 exam date has been announced by the Union Public Service Commission (UPSC). As per the UPSC 2019 timetable provided, the civil services preliminary exam will be held on 2nd June 2019. The UPSC civil services mains exam will be from 20th September 2019. The UPSC notification for the prelims 2019 will be out on 19th February 2019. The last date for the receipt of applications would be 18th March. Read More: How should I prepare for UPSC 2018 prelims? Premises Exam UPSC is the first step of CSE. It consists of two papers, including MCQ / objective-type questions. The second phase is the UPSC Main Examination, which includes nine descriptive papers. The final phase is the Personality Test or UPSC Interview which is organized in New Delhi. In each stage candidates, it needs to be cleared before going to the later stage. In the end, service and cadre are assigned to the candidate on the basis of the rank, priority, and category of candidate received, and the number of vacancies for that year. The Civil Services Examination is one of the most prestigious and toughest examinations conducted in India. To understand the exam, one needs to understand the whole curriculum. This helps in eliminating inadequate efforts, such as unnecessary disadvantages of time, and combines strictly on UPSC expectations from one day. UPSC is an Indian Administrative Service, Indian Foreign Service, Indian Police Service, Indian Revenue Service (Customs and central excise duty), for a few names. General Studies is the first paper of the preliminary examination. This test is taken to test the general awareness of a candidate in a wide range. Subjects that are included in General Studies: Geography, Indian Polity, Environment and Ecology, History, Indian Economy, Science and Technology, International Relations and associated UPSC current affairs. The motive of this examination is to assess the eligibility of the candidate in solving “logical and analytical” or ‘Reasoning and Analytical’ questions, besides ‘reading understanding’ and sometimes ‘decision-making’ questions. The ‘decision-making’ questions are generally free from negative marks. The marks obtained in the Prelims will not be added up while arriving at the final rank list. The Mains examination constitutes the 2nd stage of the Civil Services Examination. The candidate who successfully qualified the prelims examination would be allowed to write the Mains examination. The Mains examination is to tests the candidate’s academic talent and his/her ability to present his/her understanding according to the requirements of the question in a time-bound manner. The candidate will be interviewed by a board, which will record his career in front of him. The candidates will be asked questions on matters of general interest. The aim of the interview is to judge and evaluate the individual’s suitability of the candidate for careers in the public services by the board of fair supervisors. The objective of the examination is to judge the supersensible capacity of the candidates. Final Rank – The candidate’s rank in the UPSC Civil Services Examination depends only on the prints made in the main and interview. There are 1750 marks in the main examination while 275 points in the interview.